I never appreciated language as a kid. Once I discovered the joy of books, especially my Bible, I began to love words. I study words, their usage, etymology, and development. But words never stand alone. The study of words must never be divorced from syntax, or word order. No word can be properly understood outside a syntactical relationship. Words aren’t anarchists or freelancers, they are part of a team governed by rules. 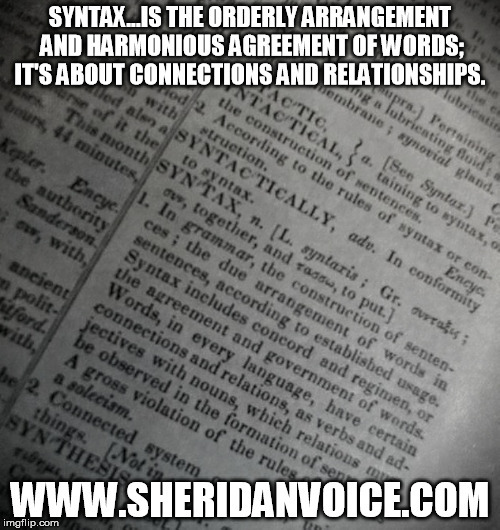 Syntax, then, is the orderly arrangement and harmonious agreement of words; it’s about connections and relationships. Please indulge me as I talk about the Bible for a moment in relation to this topic. Jesus is called the Logos, or the Word; He’s also called the Alpha and Omega, the first and last letters of the Greek Alphabet, both vowels. The ancient Hebrew Bible doesn’t contain vowels, so the translators have to discover which ones need to be supplied by carefully paying attention to the context. Then one day the Word, the Alpha and Omega, was made flesh, thus permanently solving the missing vowel problem. Christ, by supplying the vowels in His person, brings to perfection the harmonious revelation of God to mankind. The Philosophers, unsatisfied by their philosophies, longed for a Logos from God. Christ is the answer to that prayer supplying the words the Philosophers couldn’t locate. No wonder the accusation on the Cross was written in the language of revealed religion – Hebrew, the language of science, philosophy, art, and culture – Greek, and the language of law and power – Latin. Grace and Truth came by Jesus Christ. We are made in the image of God. God communicates with words. We communicate with words. Our words can tear down or build up, instruct, and edify. Syntax, again, is the arrangement and inter-relations among words in a sentence, the structure of the sentence. Grammar is about style. Strunk and White wrote a book about grammar called, “The Elements of STYLE.” Grammar isn’t about rigid rules that bind us, it’s about being stylish! May our lives be a string of sentences which are syntactically harmonious, and dare I say, stylish! We are writing our auto-biography ever day one sentence at a time. How will the finished volume read?